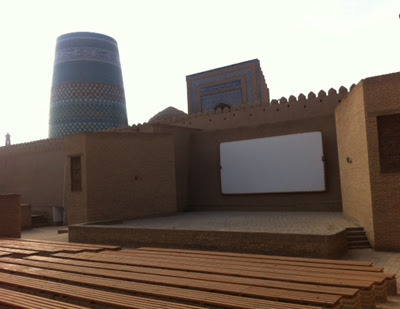 This autumn saw the revival of the open-air cinema in the ancient walled city of Khiva, western Uzbekistan. The cinema is in Kunya Ark, the earliest palace of the Khivan Khans, the foundations of which date back to the 5th century AD. It is a spectacular setting for this initiative. The open-air cinema was first created in the Ark during Soviet times, but fell into disuse until September 2012. 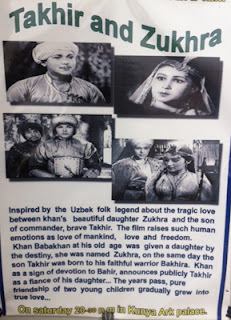 Now visitors can view black and white classics of Uzbek cinema, with English subtitles, free of charge every night of the week during the tourist seasons of spring and autumn. The cinema has been named in honour of Khudaybergen Divanov, the Khivan-born father of Uzbek photography. He also produced the first Uzbek documentary featuring Asfandiyar, the Khan of Khiva, riding in a phaeton carriage in 1910. The features start at around 8:00pm and the entrance is from a small, magnificently carved Khivan door on the main street (not through the usual Ark entrance), more or less opposite the Orient Star hotel. There are movie posters all over Khiva advertising the films. The films are often love stories or comedies. 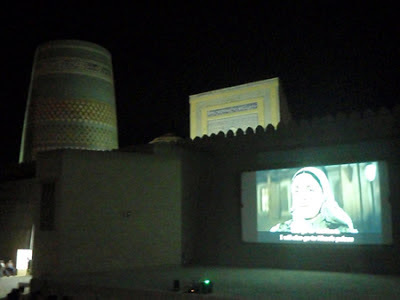 The sets are particularly interesting: viewing how Uzbeks dressed, cooked, and travelled during the period of the the film. Political issues are raised as well as the struggles of family obligations. In September I saw O'tgan Kunlar (Bygone Days), made in 1969 and based on Abdulla Qodiriy's 1922 book, regarded as Uzbekistan's first novel. (Abdulla Qodiriy was repressed during Stalin’s Great Terror of the 1930s). Set in the Ferghana Valley on the eve of Russian conquest in the 19th century, the movie tells the story of a loving couple who become victims of social traditions on the one hand and political intrigues of the court of the last Khan of Kokand on the other. Khiva itself makes a splendid film set. The Constantinople section of the 1992 film Orlando, starring Tilda Swinton, was filmed there. Kudos to Uzbek Tourism and Khiva City government for this special evening treat. Update May 2016: Regrettably, it seems the Khiva cinema no longer operates.